How did you manage to create a sense of the fleeting moment rather than a pose? I’m not sure I was successful with this or not, I tried to create a sense of the fleeting moment by drawing as quick as possible, or at least I started off that way, then got carried away. I would have been more successful doing rougher more abstract sketches like in the Sitting and Waiting exercise. Like that exercise oil pastel may have also been a better medium for this exercise. 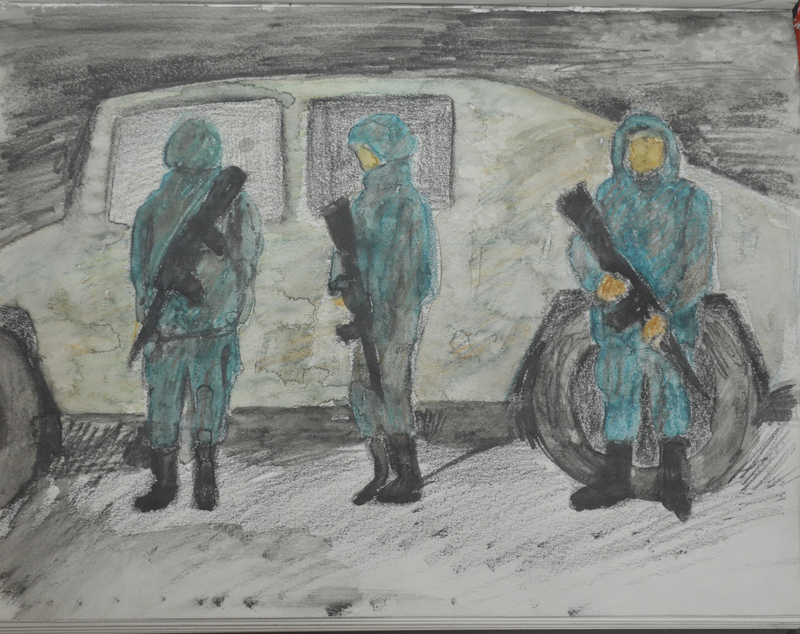 For me, I think the best drawing for the Fleeting Moment exercise was the watercolour pencil sketch of the soldiers as it was very smudged which helped me to create a blurred image. How successful were your attempts to retain an image and draw later? I didn’t give myself much chance to do this as I made quick sketches just after, to help me record the image. I have a very good long term memory but my short term memory is none existent so this was necessary. Where you able to keep to a few descriptive lines to suggest the persons movement? I made a sketch and a drawing for each image. In the sketch, yes but I weren’t satisfied with them and followed up with a drawing. I refrained from using oil pastel in this exercise as I have used it a lot in this project but looking back at the drawings I have done through this would have been the best medium for this exercise.